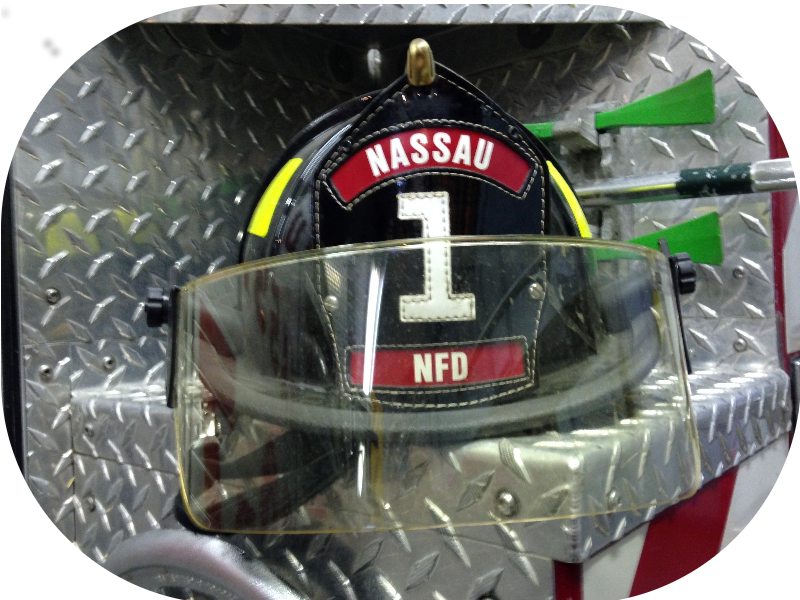 There is documented evidence of firefighting in Nassau as far back as the 1830’s. 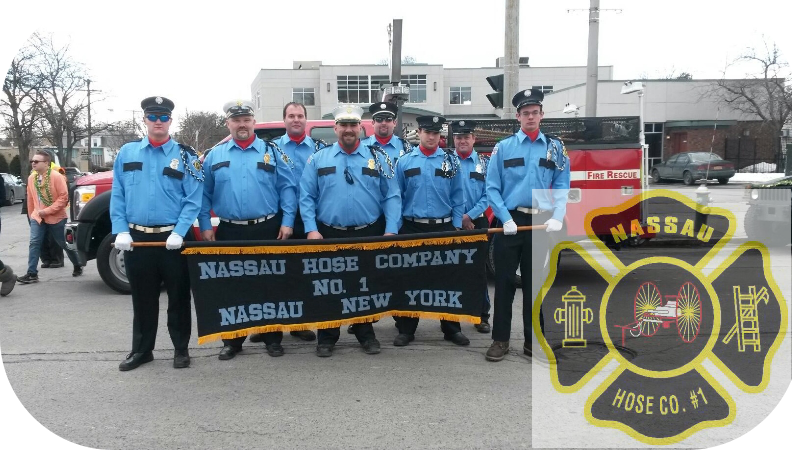 Our own Nassau Hose Co. No. 1 was not formally organized until February, 1903. The principal firefighting equipment at that time was a high-wheeled hose cart which was purchased in 1866. It was pulled by hand and used with a small hydrant system which was installed that same year. The Firehouse was located on Malden Street near the intersection of Griswald Street. In 1908, the building was physically moved to the site of our present Village Hall. In these early days, the fire alarm system was unique. There are reports that the steam whistle on the old Grubb and Kosegarten Piano Factory was used to signal the firefighters. This depended on sufficient steam to sound the alarm which was not always possible. Another report states that the Central Tele-Phone Operator would ring all the firefighter’s phones at once. Keep in mind, not all firefighters had telephones. To comply with this statement, the fireman purchased a new siren that was erected on the firehouse. In November 1926, over the reluctance of some of the taxpayers, the Village purchased its first motorized fire vehicle. It was an American LaFrance and its purchase price was approximately $7,000.00; a pretty good value in view of the fact that this truck served the Village of Nassau of almost thirty years. In 1931, the firemen of the hose company purchased the Roshirt Bottle Works Building known to many present day residents as the dress factory. It still stands as one of Agway’s storage buildings. Records show that the charge to the Village for housing its equipment was $20.00 per month. This building over the years housed many different activities including the fireman funded Drum & Bugle Corps. In 1943, the firehouse location changed to its present location on Chatham Street. This building was the Nassau Union School and was purchased from the School District for one dollar. The building underwent a few alterations to accommodate the fire apparatus. After the war ended in 1946, the Hose Company purchased a surplus WWII Ford pumper for $1,800.00. This pumper became the Hose Company’s first motorized tanker. In 1955, the Hose Company purchased a new International for $14,000.00 to replace its American LaFrance. This apparatus became the area’s first “super pumper.” It was custom built at Cronin’s Body Works on John Street in Nassau. It was able to pump 750 gallons of water per minute and could hold 1,000 gallons of water. Approximately around 1963, the Hose Company realized they needed to purchases an additional fire truck. The existing floor in the Firehouse would not accommodate the weight of two large fire trucks. To address this issue, a committee was formed and drafted two proposals. The first proposal sought to build a new firehouse facing John Street and the second proposal sought to add three new truck bays to the existing firehouse. After a Committee vote, the proposal to add three new bays to the existing firehouse won and the addition was completed. In 1964, the old WWII surplus Ford was replaced by a new Ford costing $20,000.00. A fourth truck bay was added around 1970. This bay housed a new 1970 Dodge brush fire truck. This new truck cost $14,522.00. In 1976, a new Ford fire truck was purchased for $48,000.00. This new truck featured a crew cab enabling firefighters to be equipped with air packs prior to arrival to a fire scene. This truck retired the 1955 International and was later purchased by the Best-Luther Fire Company. brotherhood of man. They live it.